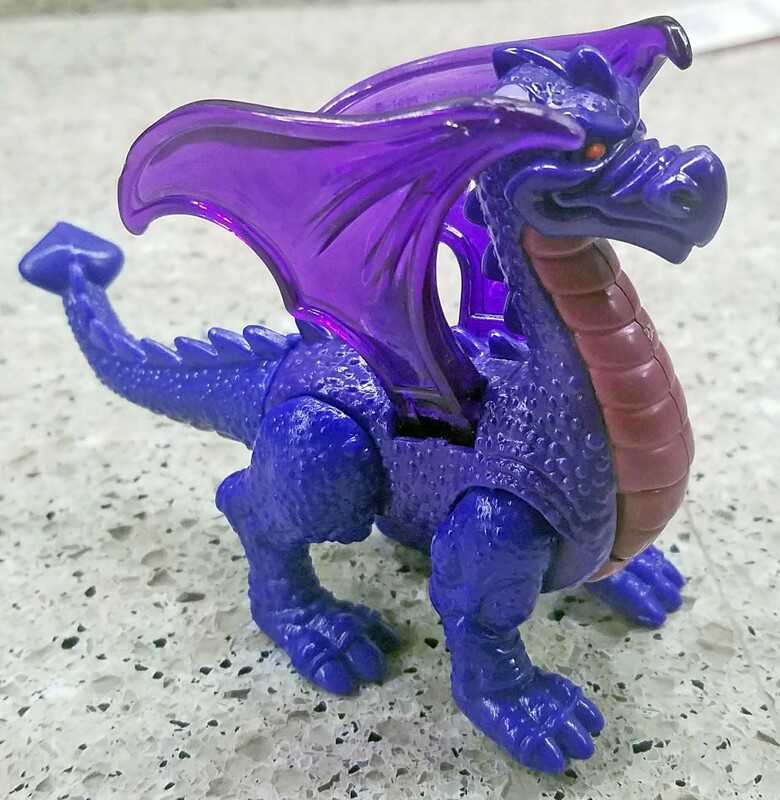 Even though the tragedy of budget cuts pushed Beastly Kingdom out of Phase 1 – the park media, logos and merchandise still to contained a Dragon as a prominent figure. 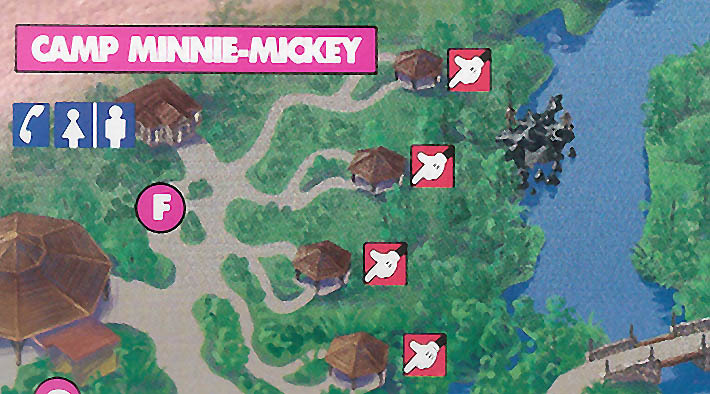 Materials would vaguely reference how the original concept for the park included an animal fantasy area with a topiary castle as a central icon. DAK Logo – The Dragon is smack dab in the middle. 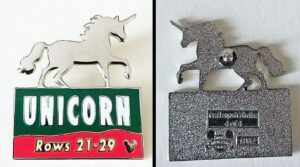 The parking lot made reference since 1998, specifically for those parked in Rows 21 – 29 Unicorn Section. Apparently, if it’s not broke, don’t fix it. 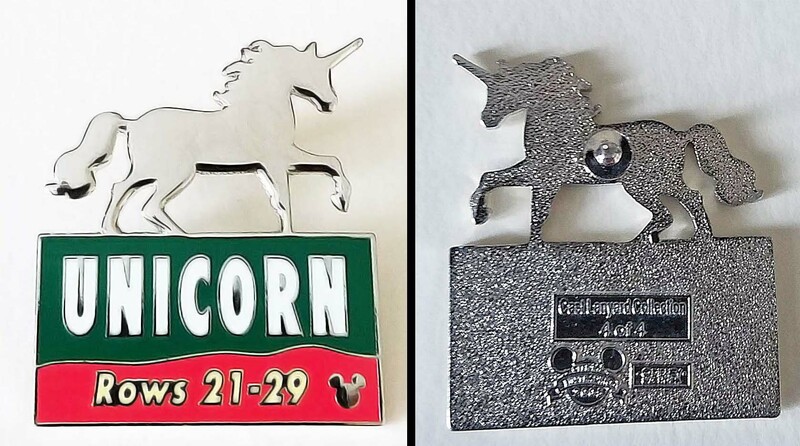 In 2005, years after park opening, as part of the Cast Lanyard Series (also known as the Hidden Mickey Pin Collections), a set of pins representing the sections of the parking lots was introduced. While the Yeti lot was later added to handle additional crowds, the Unicorn continues to hint at what could have been. 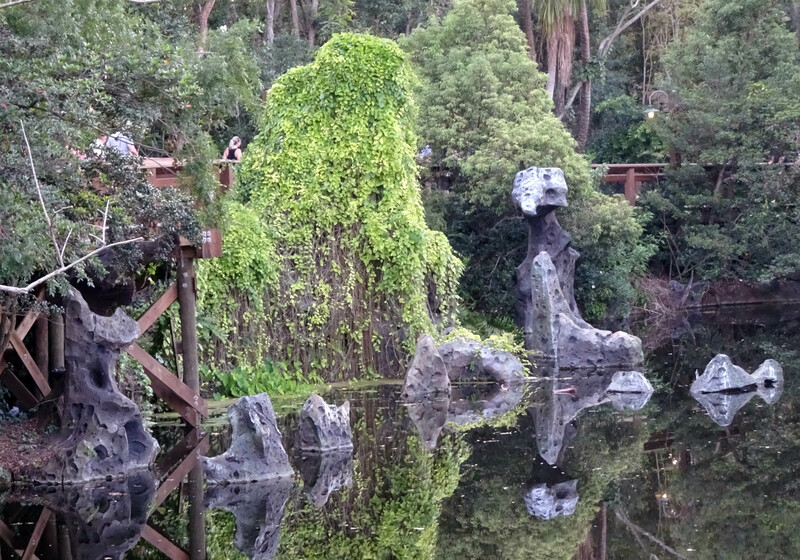 At the entrance to the park, three giant heads have always loomed over guests. 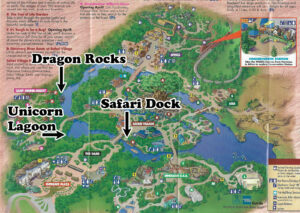 An elephant, triceratops and dragon have been in place since park opening. 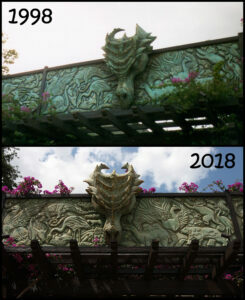 The dragon head remains today, unchanged, staring down at each guest that walks underneath. Given the change of events, perhaps it should be swapped out for a Banshee head or the Yeti of the Forbidden Mountain. 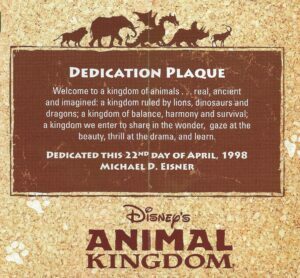 DAK Dedication Plaque 1998 as reprinted from the 15th anniversary guide map. 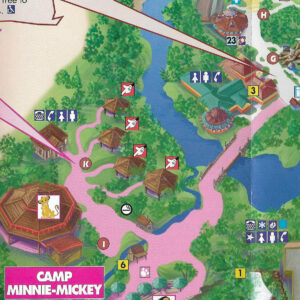 During the final stretch of construction of the park, the fantasy elements had been reduced to only a few items in the vicinity of Camp Minnie-Mickey. 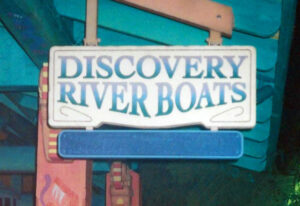 These show elements were best seen aboard the Discovery Riverboats. Unicorn Lagoon! Just a taste of the great mythical animals to come. 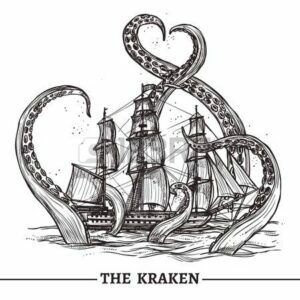 The Kraken! An unexpected attack from deep beneath the murky waters. Stone Dragon! Forever keeping watch along the river bank. Dragon Rocks! Prepare to be surprised. Onboard a riverboat at the Safari Dock. Ahead beyond the bridge lies “a few surprises” according to the guidebook. Our cheerful skippers will keep you safe on your voyage. After leaving the safari dock, passing under the Oasis bridge and rounding off to the left, guests would encounter the lagoon. 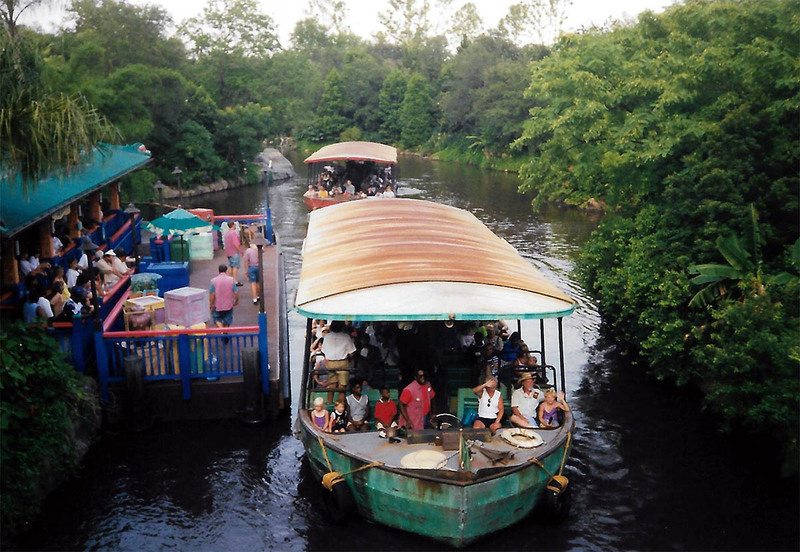 The first “fantasy” element encountered from the Discovery Riverboats was to be the Unicorn, hanging out at Unicorn Lagoon. Yes, this was simply just a statue – possibly 8-10 feet high. 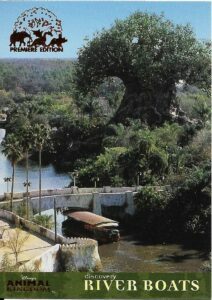 Unfortunately, I do not have a picture of the beast along the river, as it had been removed by March 1998. The map reference to the left is taken from the cast preview map March 4 – 8, 1998. 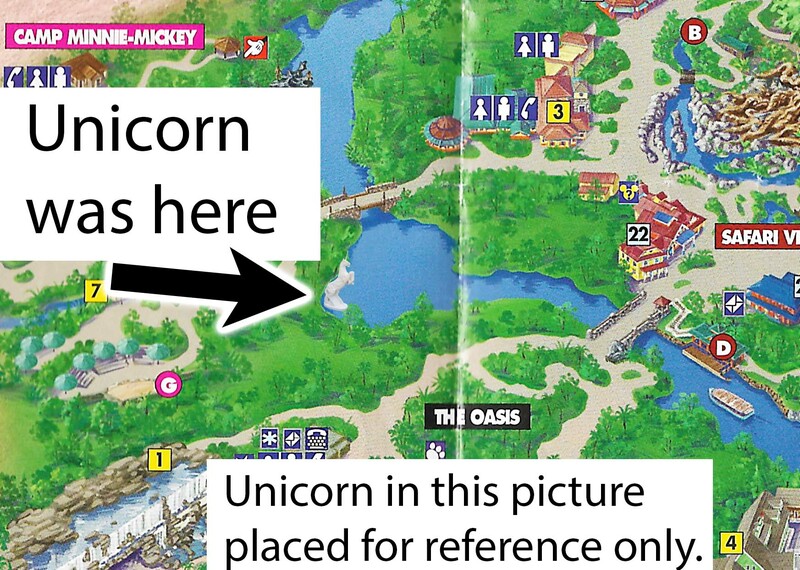 When the unicorn was first placed in the lagoon, it was bright white and brand new. Later, it was quickly “aged” to make it appear ancient and mysterious. Finally, for reasons unknown, the unicorn was removed altogether. 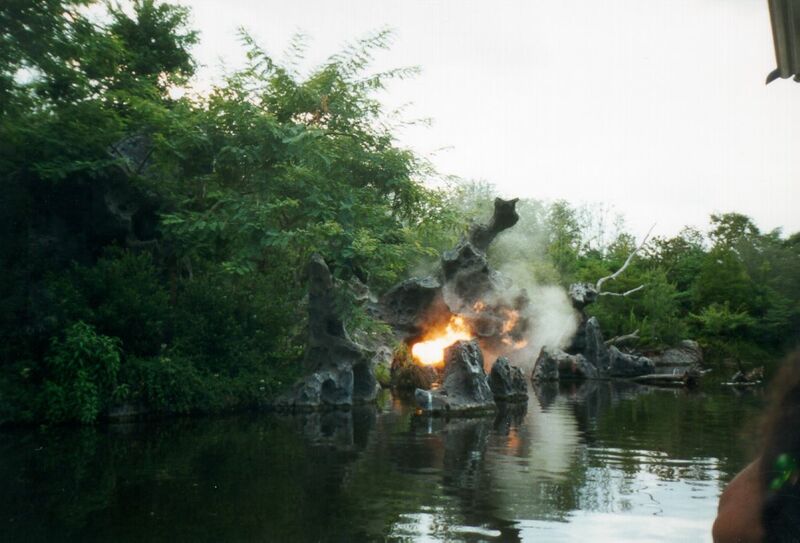 Empty Unicorn Lagoon – The status once existed on this bank. After the removal of the statue, a note was sent out regarding the revision to the script. 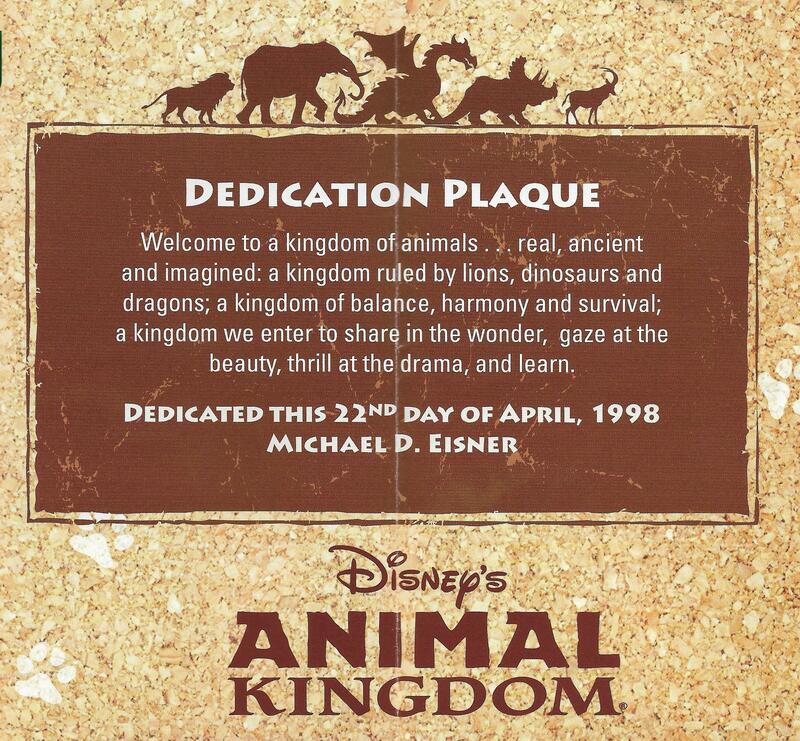 “Disney’s Animal Kingdom pays tribute to all the animals that ever were, and those that never were…” – now to be discussed further down river. There were various rumors for a while about what may be added to spice up the lagoon, such as placing deer along the left bank, however, that never happened. In order to fill the void, skippers often improvised a bit. At one time, there was a nest of native hatchlings, and later an owl that hung out in this area. A joke would occasionally be made in reference to the hibiscus up high and the low-biscus down low. This giant creature lurks in the waters of the Discovery River! 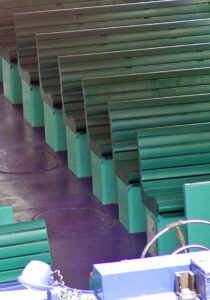 Transducers to vibrate the boat were attached inside the benches. The attack was accomplished by transducers attached to the bottom of each bench. 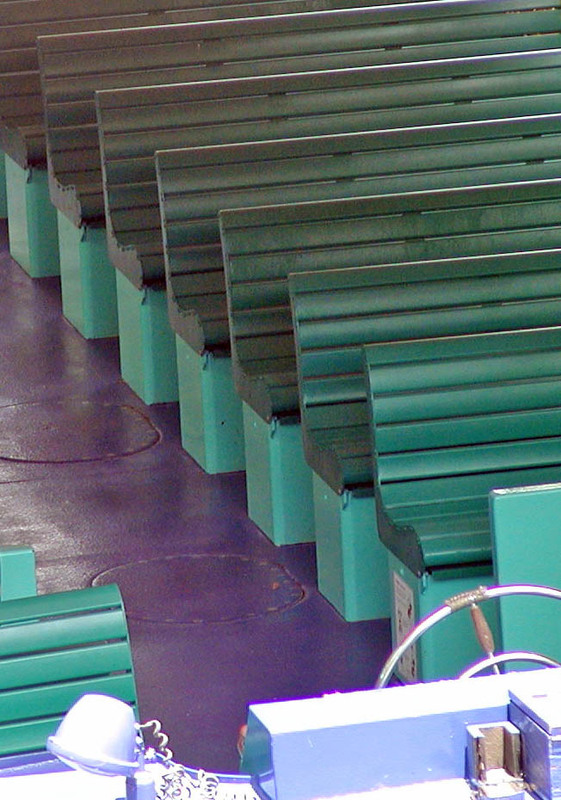 If you tilted any bench forward, as mentioned by the skipper after your boarded, you would see a storage area containing left vests in addition to a transducer fixed to the underside of the bench. 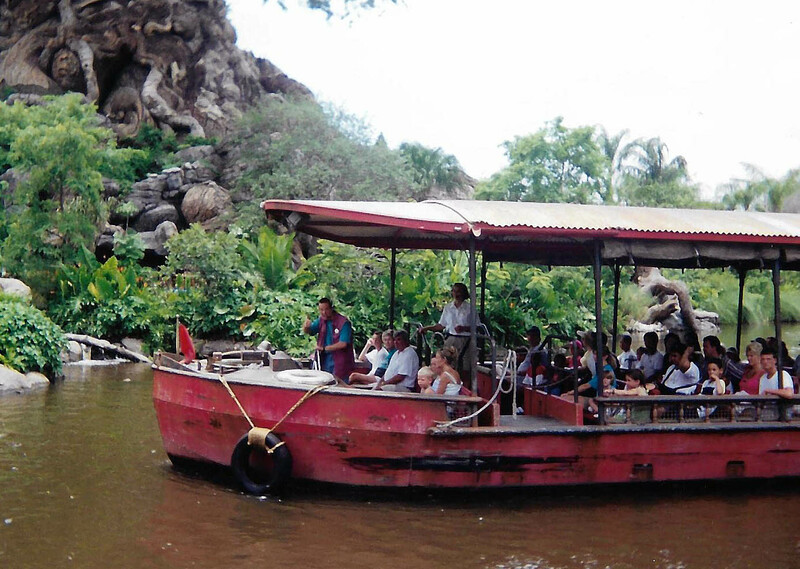 Only one boat was known to actually have a working set of transducers, the Scarlet Flamingo. These transducers would provide lots of vibration when activated. The idea was to simulate an attack from under the boat, deep in the water. The reality actually felt more like the boat had run aground. 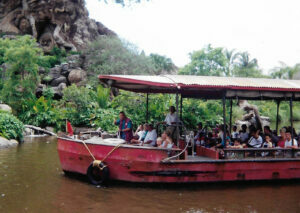 Unfortunately, the attack was never fully put into service or used in the final attraction. 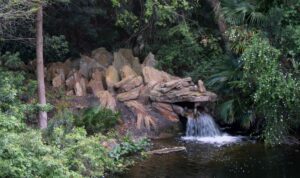 Just past the Camp Minnie-Mickey bridge, on the bank of Camp Minnie-Mickey, a pile of stones that somewhat resemble a dragon appear. As of 2018, the pile from 1998 is still intact. 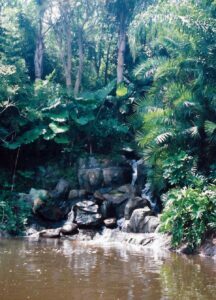 Water pours out of the mouth and into the Discovery River. 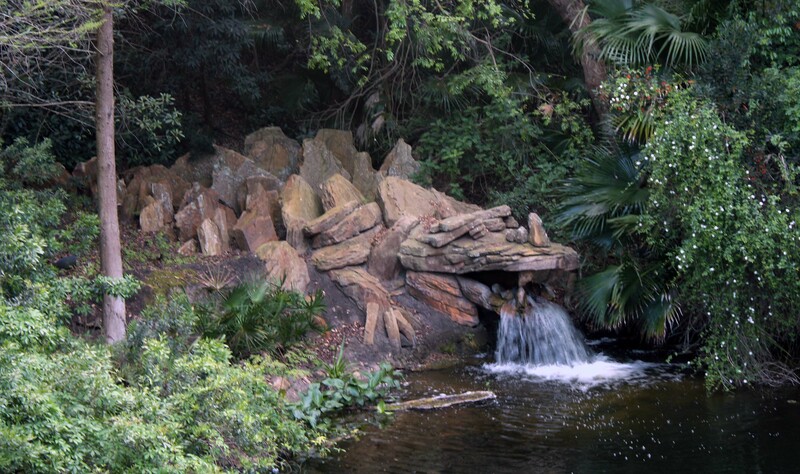 This water is actually from the stream that ran through Camp Minnie-Mickey. 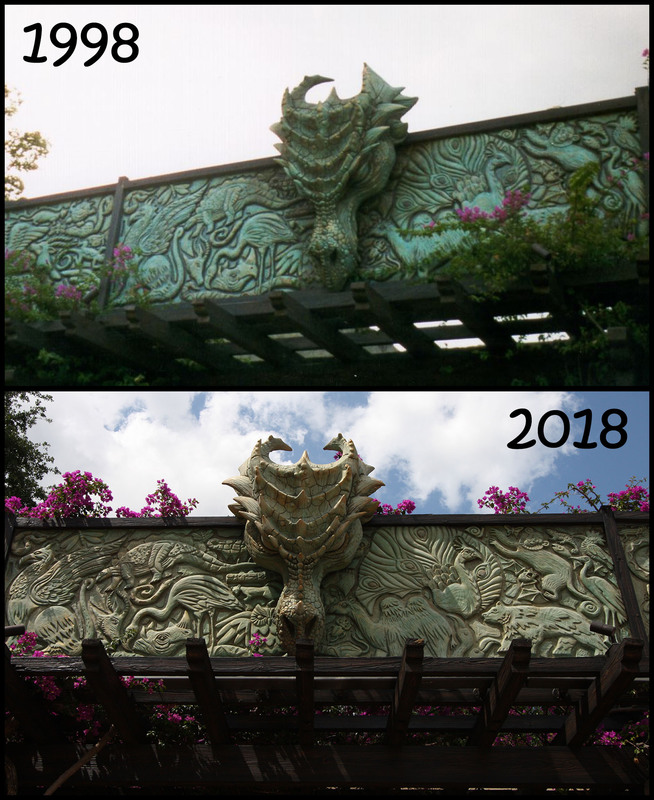 The Riverboat script never directly referenced this structure, and it is a bit surprising that it survived the Pandora – The World of Avatar remodel. 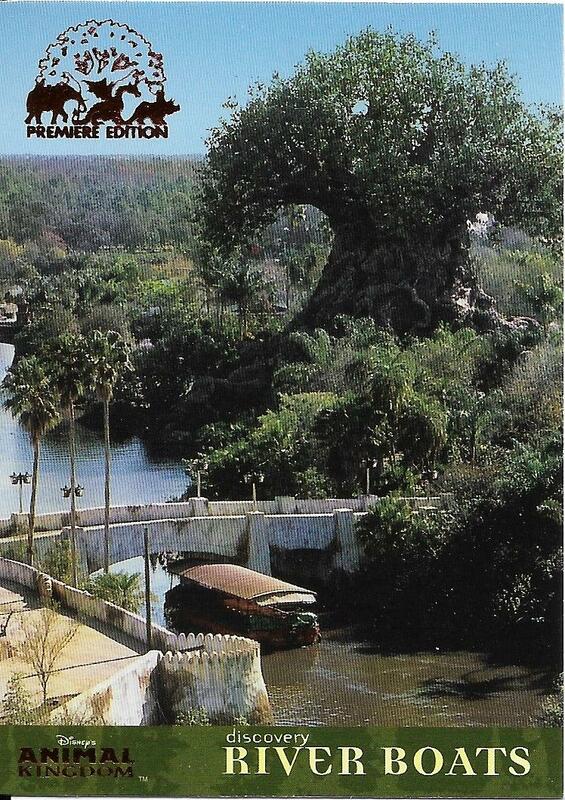 Perhaps it is odd enough looking that it could fit into the world of Avatar. A bit worse for wear in 2018, but the overgrowth had been trimmed back. Dragon Rocks in Action! One of the few pictures with the knight’s armor intact. 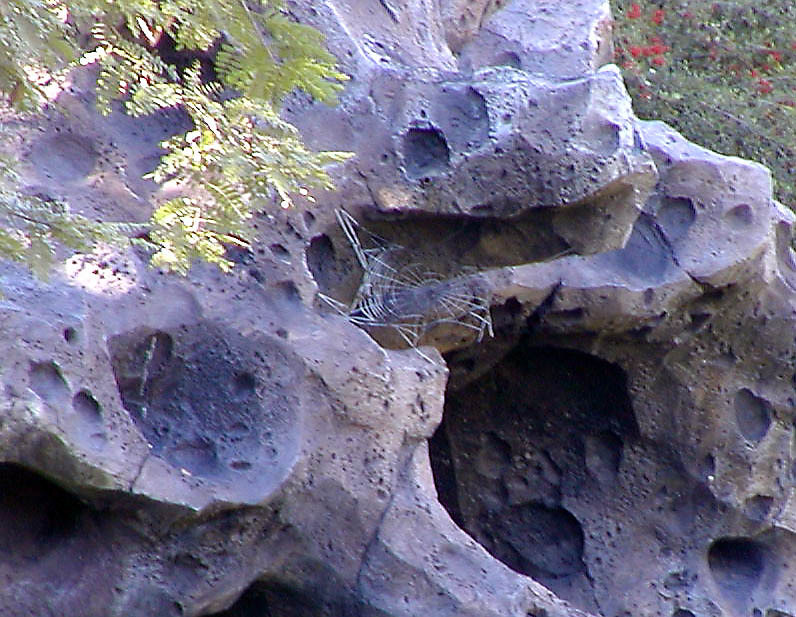 A stretch of the river, located just north of the Camp Minnie-Mickey bridge, became home to what is known as Dragon Rocks. 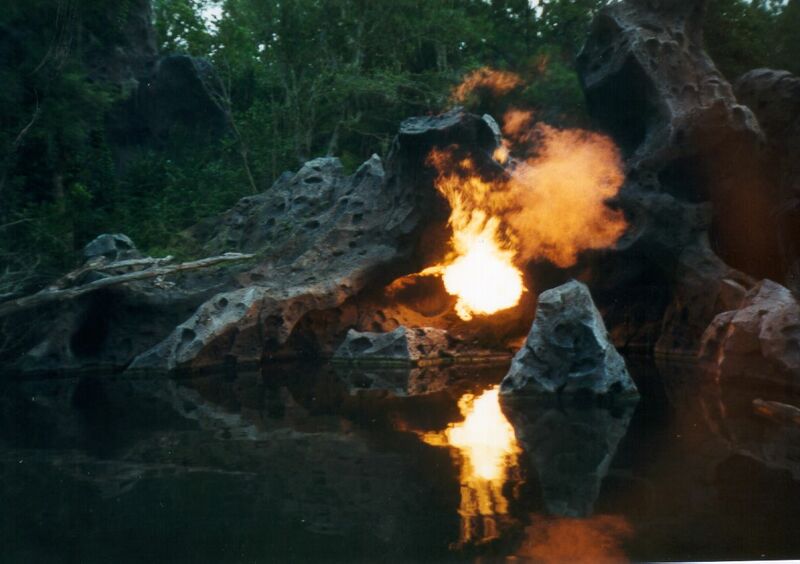 Initially envisioned as a full size cave with a fire breathing animatronic dragon attaching the riverboat, it was reduced to much less. 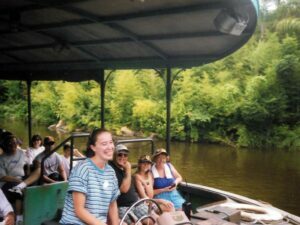 The initial experience included a large area of volcanic rocks on the left bank of the river (note: the boats always ran clockwise). The remains of a half a dozen braves knight’s armor was scattered about the rocks. Melted, skewered, torn in half, bitten off — these knights must have lost an epic battle to the dragon. As the boat approached, smoke billowed from the cave, thunderous roars were heard, and massive flames shot out from inside the cave. Often heard, but never seen, the dragon roars from the safety of the cave. For unknown reasons, the knight’s armor vanished by March. Strangely enough, this did not warrant an update to the map. 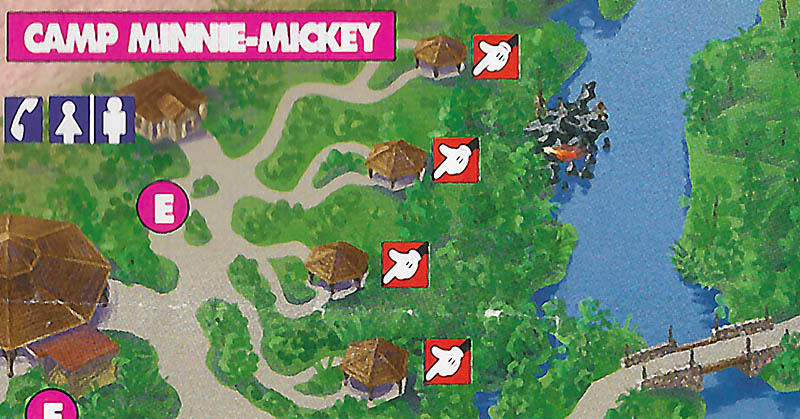 If scrutinized closely, 2 of the knights can been seen in the tiny image of the rocks on the map. The earliest copy of a map that I have is from March (4-8) 1998. The rocks are featured on the river just off the banks outside of Camp Minnie-Minnie with a flame shooting out into the river. Flames would typically shoot out multiple times as the boat crept by. Strategically placed barriers in the water would keep the boat from accidentally running into the rocks should a skipper not steer properly. 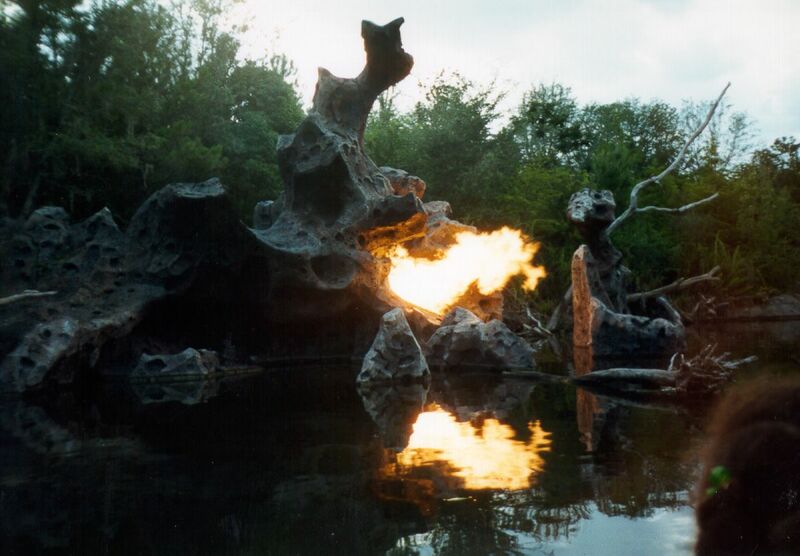 In order to time the dragon effects for each boat, sensors along the bank would be triggered to enable the show effects. While the dragon had been shutdown in April, it wasn’t until June that the map finally caught up. The rocks continued to appear (along with hints of the armor), but the flame was removed. 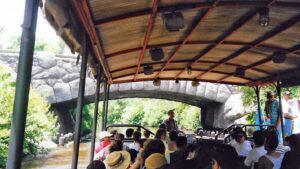 With the return of the Discovery Riverboats, retooled as the Radio Disney River Cruise, the dragon effects were reactivated. The spider connection was revisited and there was some connection made to the fire shooting out of the cave related to a spider. If you look closely at the picture, you will see a spider web now attacked to the rocks. 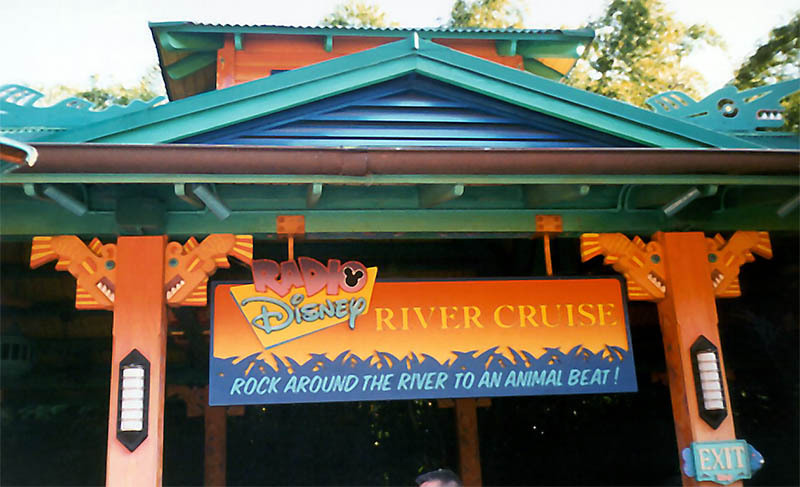 When the map was retooled in 1999, the reference of the rocks was removed completely. 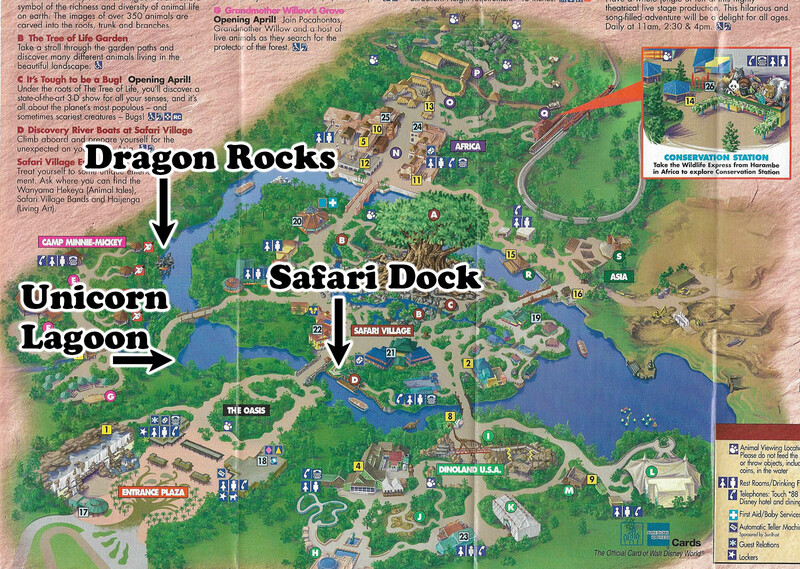 DAK Map 2000 – Dragon Rocks no longer appears on the map. Fast forward nearly 20 years to 2017. 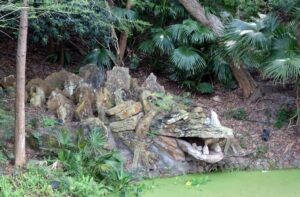 Pandora – The World of Avatar took over Camp Minnie-Mickey and finally put the rest the fate of Beastly Kingdom. 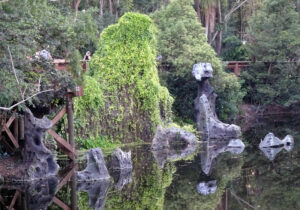 The Dragon Rocks still remain, but have been overtaken by foliage and an access bridge/boardwalk. Guests can now walk directly behind, and even lean on the rocks that were once greatly feared. The balls of fire have been extinguished, never to return. Happy Meal Dragon – Too Bad it wasn’t actually in the park. 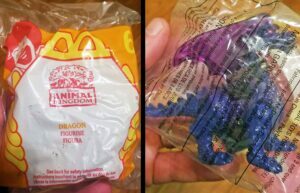 A series of Animal Kingdom Happy Meal toys was released to coincide with the opening of the park in 1998. Not only did the box show a picture of a dragon hiding in a cave along the river, one of the toys was an actual purple dragon. 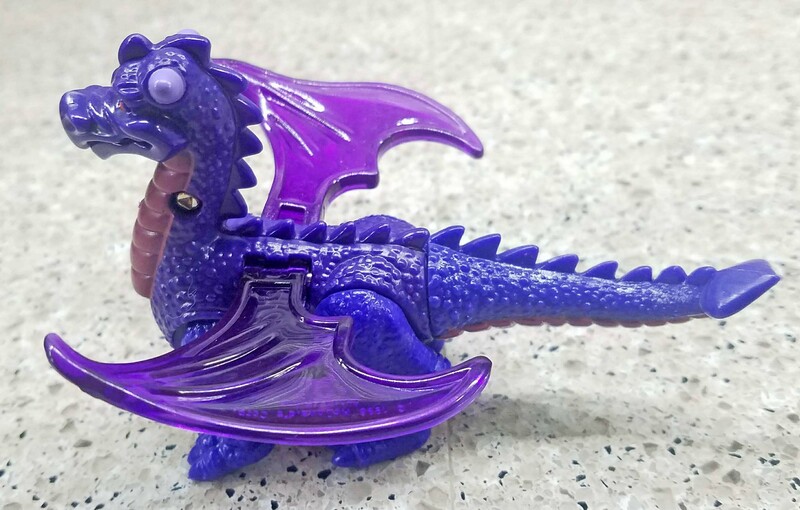 The dragon was various shared of purpose with pose-able legs and wings. It was 4″ long head to tail tip, 3″ tall and about 1.75″ wide. The bag, emblazoned with the Animal Kingdom logo, simply stated “Dragon Figurine”. The wings would fold up or down. 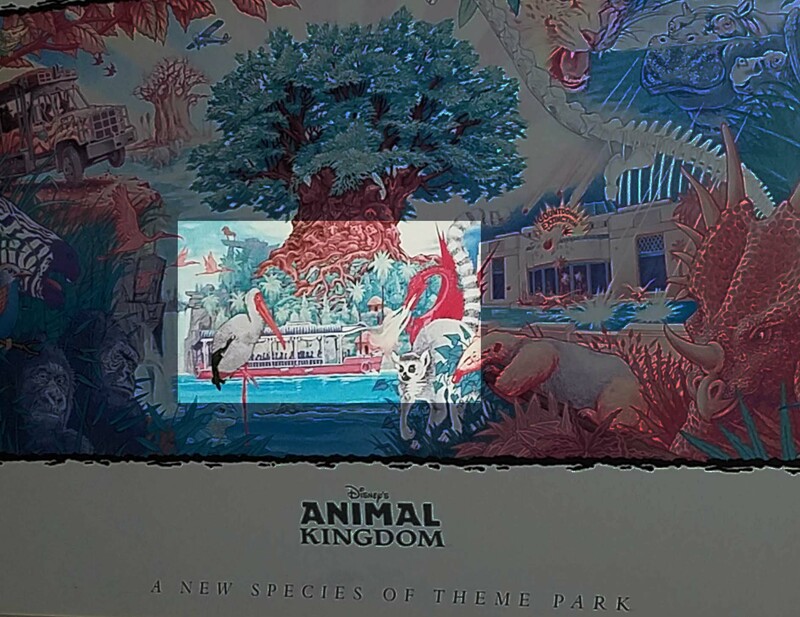 Various posters, souvenir cups, merchandise and the park map made reference to a fire breathing dragon residing along the river attacking a boat. 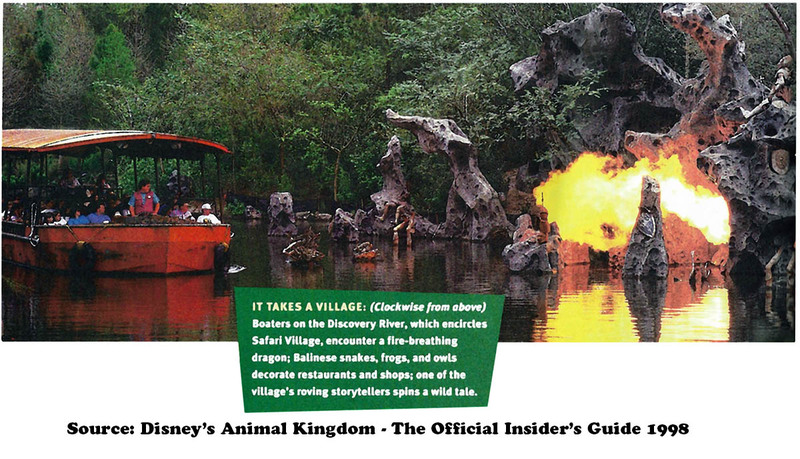 A commemorative poster distinctly shows the dragon attaching a riverboat. Remember When…. or maybe not. 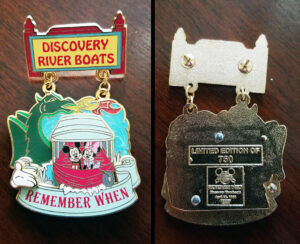 The following pin came out in 2007 as part of a “Remember When” series covering attractions that were no longer. It was limited to an edition size 750. 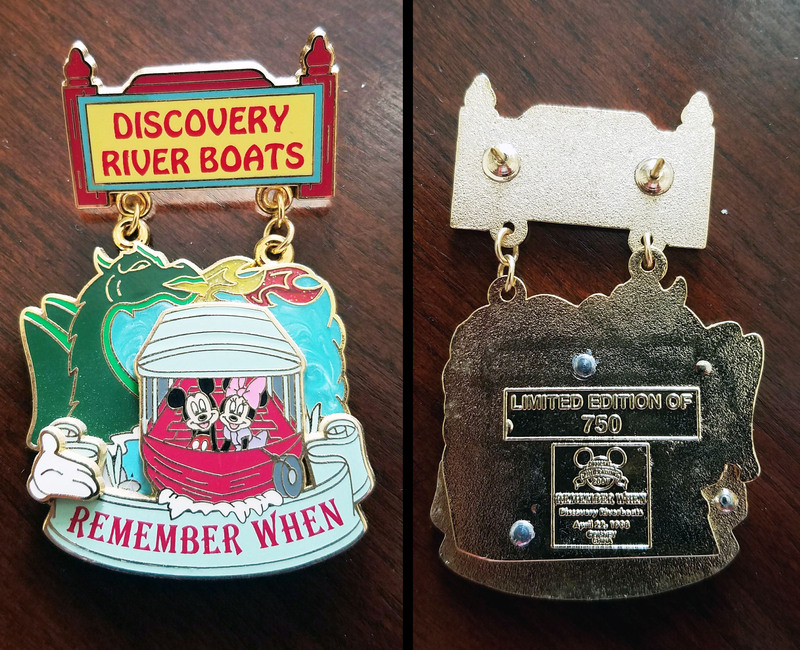 The ironic part about the pin, is that the dragon appears – when there never was a visible dragon on the river. Remember when the dragon shot flame at the boat? For additional pictures, including shots of the Happy Meal box itself, see LaughingPlace.com, JimHillMedia.com, and Dan Alexander Dizmentia Blog’s post. The unicorn was sold off in 2014 when stuff was being cleared out for Pandora construction. You can see a picture of it here. Nice, thanks for sharing! I could only recall a few details from the very early days of driving by the unicorn on the river. I was as shocked when it just up and vanished one day, although I never heard any real reason why. 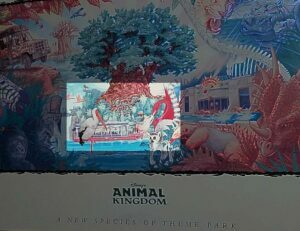 With the unicorn and kraken a no show before park opening and the dragon even taking a vacation, the idea of Beastly Kingdom was fully downplayed by the time the park opened. 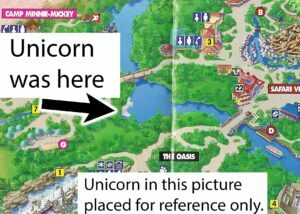 Your pasted-in image of a unicorn on the map was correct. The statue *was* rearing back on two legs. An out-of-sight support post appears to have come down from its tail and ended in a mounting plate with four bolt holes for attaching it in place. The unicorn was in the park after opening. It wasn’t removed for quite a while. I opened the park and saw it on yhe river several times after opening and a close friend worked River Boats until it closed and confirmed he was still in place. The unicorn was left sitting there. It was finally removed and was laid backstage for a while until finaly being sold through property control cast auctions. It currently is standing in my backyard in all its glory at 12 feet tall and 5 1/2 feet wide. 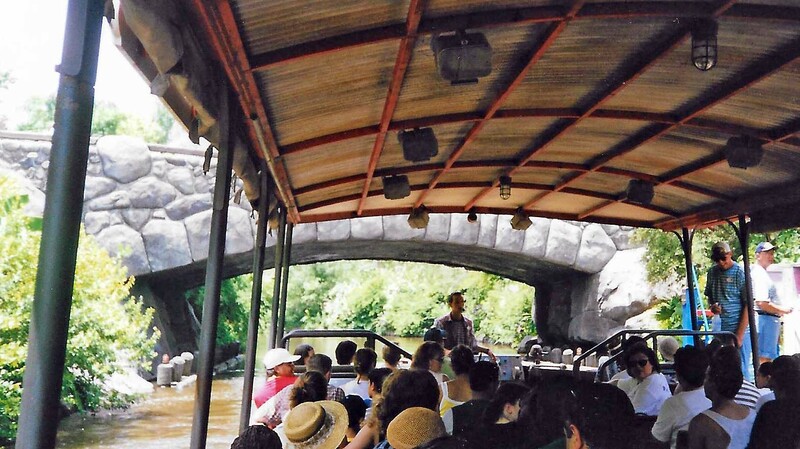 I have pictures if him in the ride and it was only found in the disney photo archive. Once we bought him we decided his name should be Beastly the Unicorn. He has a Facebook profile as B.T. Uni and a Facebook group called Beastly The Unicorn. Thanks, I’ll update with links and a few pictures. I opened the Riverboats as well and can confirm the Unicorn had been moved back stage sometime in March 1998. The script I have from mid March speaks to the sudden empty lagoon.